Chalmer Rennie from the Natural Resources Conservation Service in Washington used that justification for denying an appeal I had made of an earlier decision by Sharon Gipson from the Athens office of NRCS. 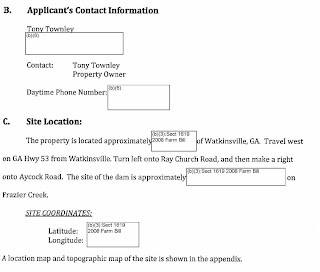 Gipson refused in April to provide me with details of Townley’s application for the farm pond exemption. The lake is on Frazier Creek, which is a tributary of the Apalachee River. Rennie said the 2008 act of Congress prohibited him from releasing the information that was used by NRCS to justify the decision to classify the pond as being needed for farm purposes. Specifically, Rennie wrote me in late June, he would not release information on location of the pond itself, acres of land served, herd sizes and the water needs of Townley. 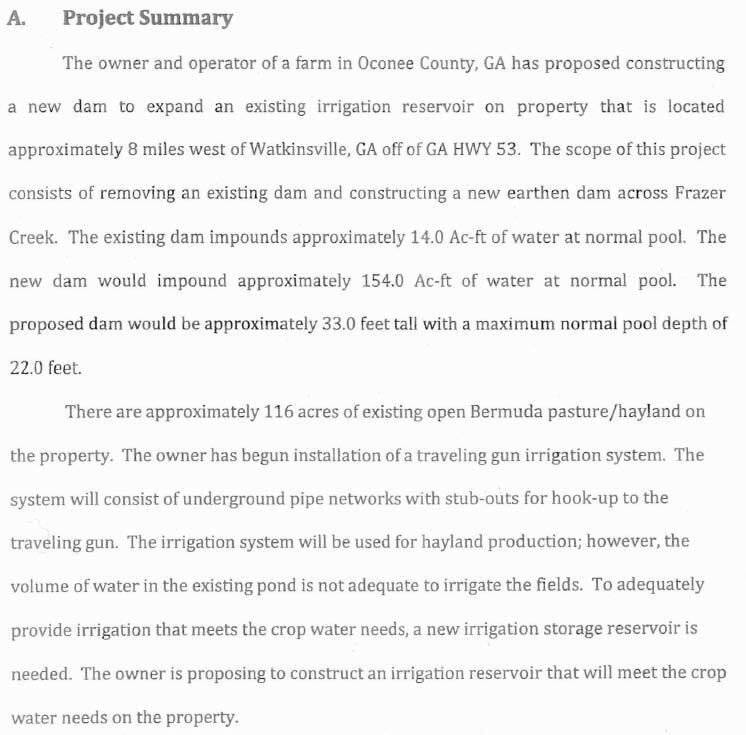 This is precisely the information that NRCS Soil Conservationist Gerald Grace told me in a telephone conversation on July 23 that he forwarded to Area Engineer Deena Roberts in the Athens office of NRCS and that she used in deciding that Townley needed the pond for his farm operation. Grace works out of the United State Department of Agriculture field office in the Government Annex Building on SR 15 on the south side of Watkinsville. NRCS is part of USDA. Townley built the lake on land south of Aycock Road in February. It is one in a series of ponds and lakes he has built on his extensive land holdings in the area. The ponds and lakes, according to the NRCS, are for irrigation of his farm lands. For that reason, Townley did not have to get a federal permit to dam a stream or disturb wetlands, as nonfarmers who disturb streams and wetlands are required to do. Townley has installed an elaborate system of pipes and sprayheads that are visible from roadways that run along his property. Townley is cofounder of restaurant company Zaxby’s and is its chief financial officer. The company has its headquarters at 1040 Founders Blvd. off Daniells Bridge Road in Oconee County. To learn about Townley’s use of the farm pond exemption, I filed open records requests earlier this year with Gipson and with the U.S. Army Corps of Engineers, which has ultimate responsibility for granting permits–and exemptions–under the federal Clean Water Act. 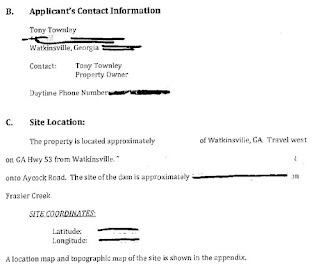 In response to the request I submitted to her, Gipson released a set of heavily redacted documents, one of which was identified as for a pond “Downstream of Aycock Road.” This document appears to be for the lake Townley constructed earlier this year. The document was dated October 2011 and prepared by J. Brian Kimsey. Gipson appears to have whited out and then used a marker to make sections of this and other applications she provided me unreadable. She provided me scanned copies of the altered documents. My appeal was based on the argument that Gipson’s action made it impossible for a “private citizen” to “monitor the activities” of NRCS. 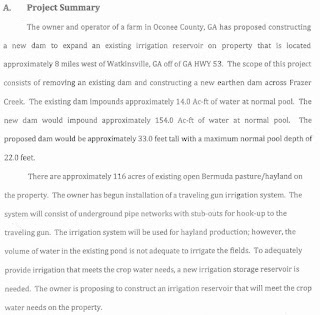 Gipson had informed me that she had identified 118 pages of documents relevant to applications by a Townley in Oconee County to obtain farm pond exemptions from the NRCS. She said she was withholding 70 pages in part. In response to my appeal, Rennie said he also identified 118 pages of records. He said he was re-releasing 48 pages in full and 70 pages in redacted form. “Cleaner redacted copies of the documents are provided,” he wrote. He used an electronic marker rather than a physical one to block out what he said he was not allowed to release. The Food, Conservation and Energy Act of 2008 was the formal name for the farm bill of that year. Rennie cited Section 1619 (b) as prohibiting disclosure of the information provided by Townley to justify construction of his farm ponds. That section prohibits disclosure of “information provided by an agricultural producer or owner of agricultural land concerning the agricultural operation, farming or conservation practices, or the land itself, in order to participate in programs of the Department” of Agriculture. Rennie said I had a “right to judicial review” of his decision if I am “dissatisfied” with it. 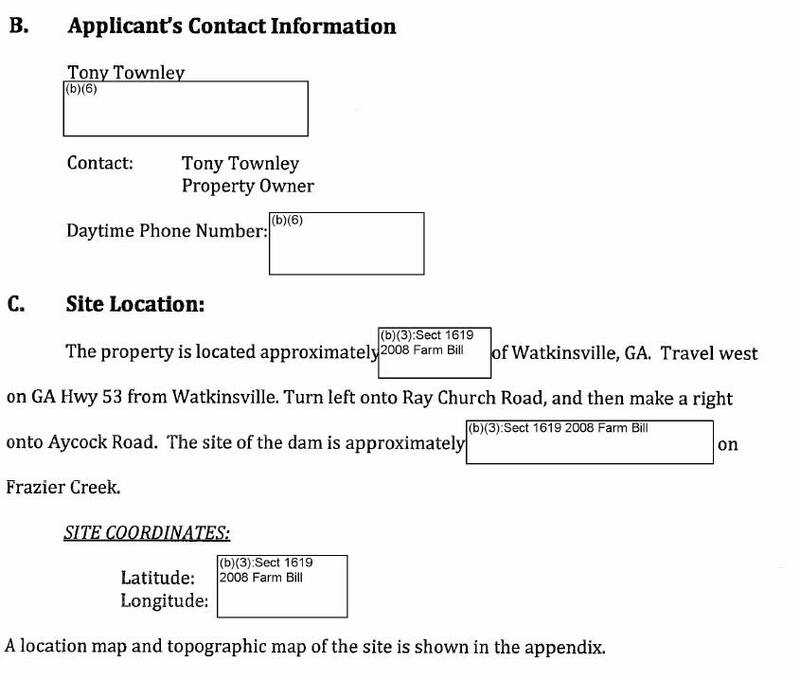 When the Corps of Engineers responded to my FOIA request, it released documents relating to a larger lake that Townley constructed on Frazier Creek upstream from the one he built this year. The lake reaches to the rear of Townley's home, and he has built a boat house on the lake at the rear of his home. 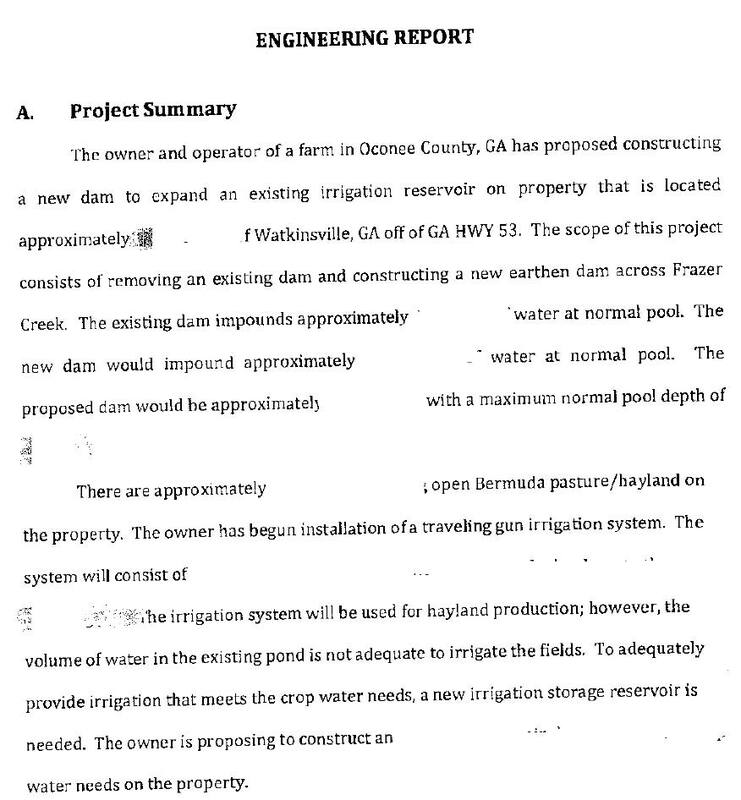 The Corps did not redact the information Townley provided to justify the need for the pond or irrigation of 116 acres of Bermuda grass. NRCS, when it released the same document, redacted that information. The pond on Aycock Road has been filling this summer, and water from the pond backs up to the culvert for Frazier Creek under Aycock Road. 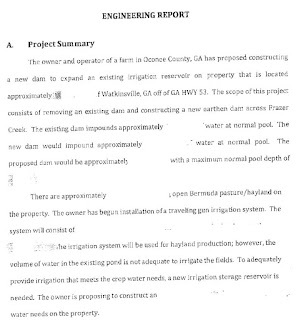 Emila Beshara, director of Public Works for Oconee County, told me in an email message in early July that the county did “routine maintenance” of that culvert this summer. Following the work on the culvert, the county also installed a new set of signs signaling the narrowness of the road as it crosses the creek. The county “installed such signage as was warranted,” Beshara said. 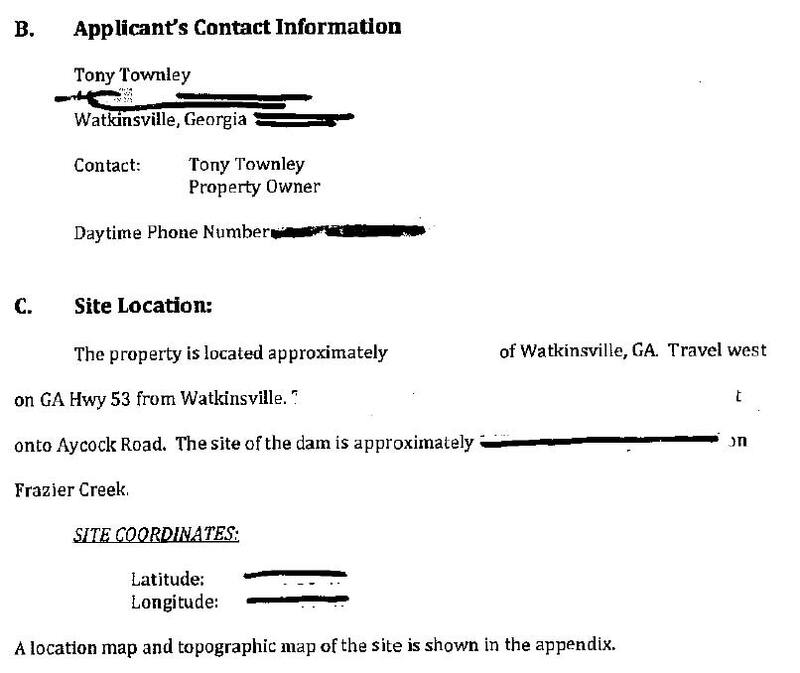 On Feb. 20, following construction of the dam for the new lake, James Knecht filed a complaint with the Georgia Environmental Protection Division. Knecht and his wife, Sandra, whose address is 1451 Aycock Road, have a home they built overlooking a lengthy shoals on Frazier Creek, downstream from the new lake. The EPD passed that complaint to the Corps of Engineers.